It’s the end of the day, we have one more session to go before the SMX After Dark networking extravaganza, and I’m still in the Semantic track – which means I am in a pretty darn good mood. Danny Sullivan (@dannysullivan) — the session moderator — starts the session by saying how he hates the word “entity” nearly as much as he hates the word “semantic.” They’re two words that mean so much but express so little, he says. He goes on to say, despite hating the word “entity” as a vague umbrella word, the actual concept of “Entity Search” is really opening up a whole world of possibility – a world where search engines don’t just match words with words, but actually begin to understand ideas. David Amerland (Author, Speaker, Analyst, @DavidAmerland) starts the session with an introduction to entities. David is going to talk about entities, how they apply, and what you can do to take advantage of them. He asks how many people know what an entity is (by show of hands). I think more people know what it is than raise their hands (we’re all scared of David’s intelligence). He asks us next (by show of hands) how many people know what a tree is. Again… more people should have raised their hands (who doesn’t know what a tree is??). He coerces us to raise our hands (we all know what trees are!) and then he asks us to close our fists and close our eyes. I am explaining all of this because it’s a great demo. With our eyes closed he says “tree” and notes that we all have an image in our heads right now. Without prompting, we all see different tress based on our understanding of what a “tree” is. If we know more than one language, when we hear tree in German we see a tree. If we don’t know German, we don’t see a tree because we don’t know that Baum means tree. 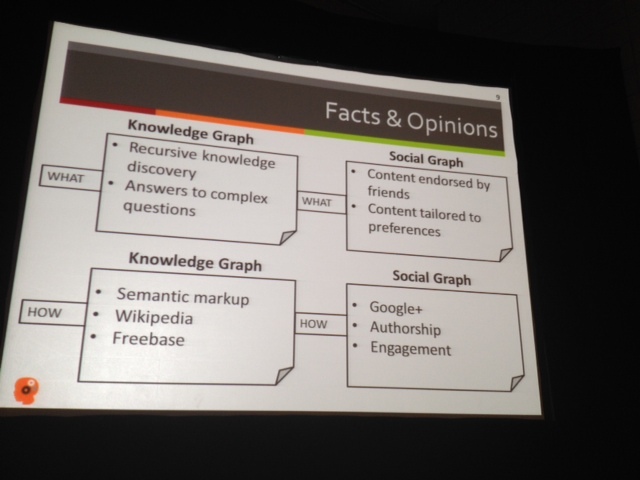 Everything you know about a tree is your own personal knowledge graph. You have your own personal contexts associated with that word. Trees are entities. Entities are concepts. We (and Google) understand entities (Concepts) based on context, experience, influence, social factors, societal factors, etc. David jokes that as SEO Professionals we used to know how the web works. “We used to understand the Matrix” he jokes. 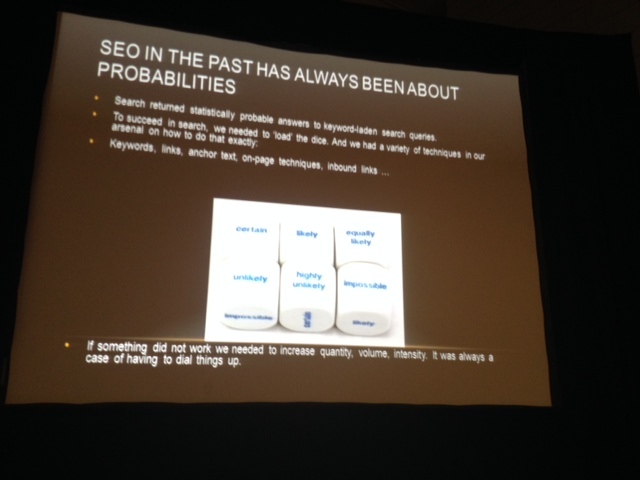 SEO in the past was a case of probabilities; search was a statistical analysis tool. Search returned keyword-rich results. 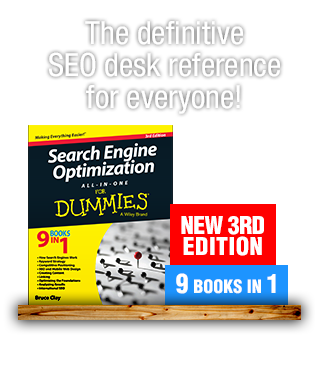 As SEOs we’re responsible for understanding the mechanics and delivering the results. As semantic web statistics begin to fade away, search itself is changing. A good example of this is Google Now. Google Now is actually learning what you need, and it’s trying to predict what you might need. For instance, if you look up directions to a place, the next time you use your phone it might let you know that the place you looked for (IE: The convention center you visited yesterday) is nine miles away and traffic is bad. The challenge for us is to understand the new landscape and what we can do within it. 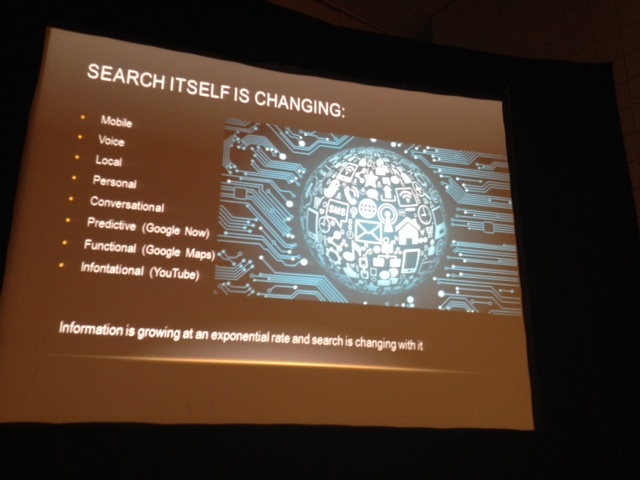 Information itself is growing at an exponential rate and search is changing with it. Variety – are you creating a good mix? There is a massive amount of the web that is unstructured data. Google’s job is to take this unstructured data and put it into a structured format. A tree (re: the entity) is a defined concept that is defined by everything it is associated with. Entities are a challenge because they provide answers at the search box rather than suggestions. “Optimization” seems to have been reduced to this single problem: Find a way to answer a single search query. Web used to be faceless, impersonal, able to be gamed. Web is now personalized; everything you do is associated with and accrued to who you are and what you do. Jonathan Goodman, President, Halyard Consulting (@halyardconsult) is up next. Metaweb ten acquired by Google; over 40 million topics; over 2k relational tables; had a metadata query language; you (can) use it to build applications. The future of search = Semantic + implied intent. Your personal historical previous searches, purchases, and sphere of influence all directly affect SERP results. It’s going to get a lot harder. We all need to try to build a sphere of influence, and we need to start marking up our pages/content with Semantic Data. Jon predicts “in 2015 backlinks will mean nothing.” He’s not sure if it will happen, but he’s hopeful. Reva McEachern, Principal Technologist, REVA Digital Media LLC (@revadigital) is up last (but not least!). She is going to talk conceptually about how people become things, or – in other words – how the Knowledge Graph becomes the Social Graph. 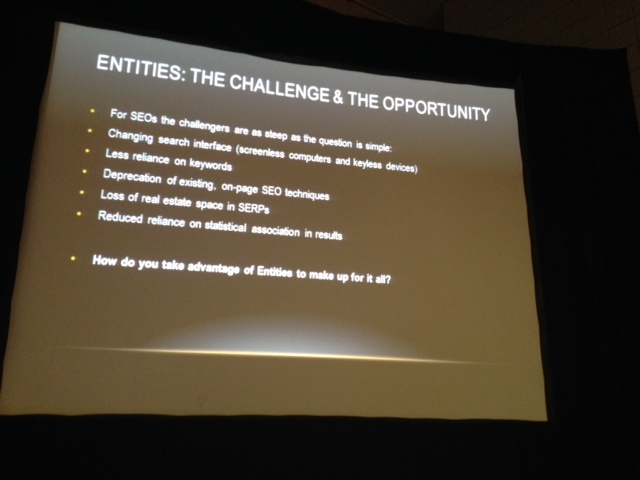 She notes how this “over optimization” technique represents the old, traditional world of SEO and SEO techniques, and the latter half reflects where search is going (IE: toward entity search). 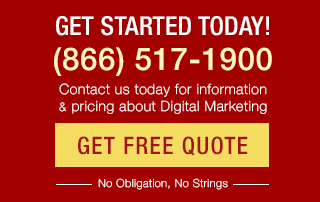 SEO and SERPs today are all about more data, not less. We’ve evolved from text and links and files to things. We’re able to (and consistently try to) make our communication more comprehensive. 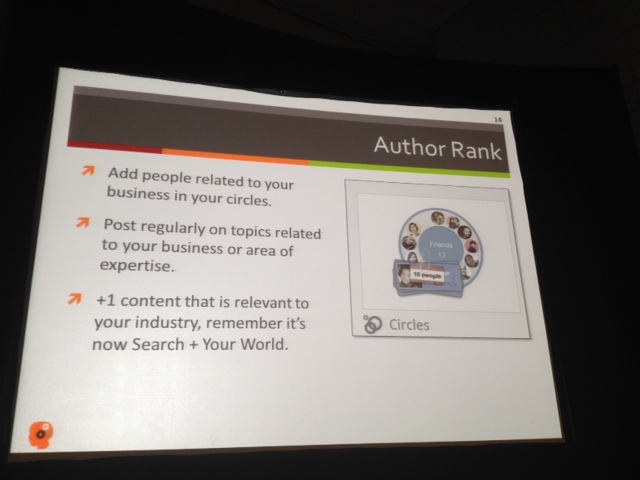 Google is relying on the social graph, the knowledge graph, and links. Google determines your preferences (and your personal search results) based on your interactions with others on the web and how they interact with you. Rich Snippets make flat pieces of text become things. How a person becomes a thing is through G+ verification. She emphasizes the importance of AuthorRank. She thinks of it like PageRank. It’s really about making connections, being authentic and participating in the community. 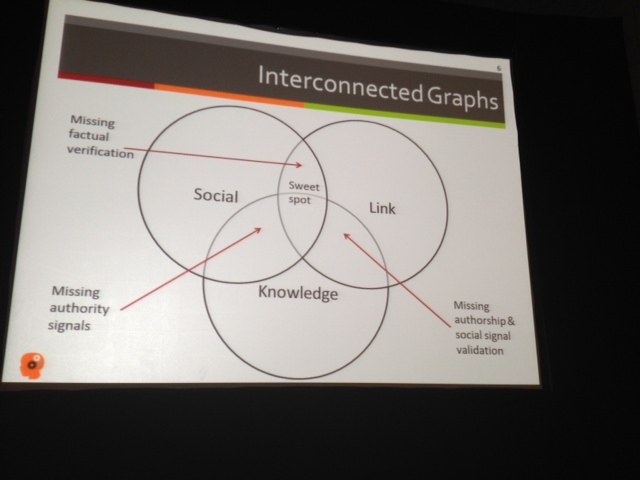 (IE: Being a player in your “sphere of influence” as Jon put it). 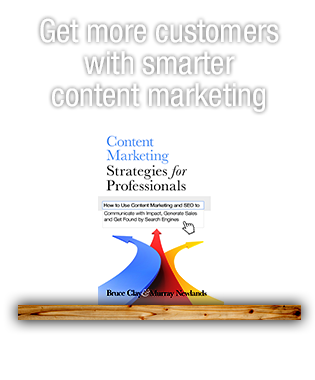 She says SEOs and Social Media Marketers really need to work together and reiterates that one key takeaway should be to markup your website with as many (relevant) schemas as possible. First — thank you for reading the post, and double thank you for actually liking it. (It’s great when that happens!) I appreciate your feedback on the writing, and I am glad the recap resonated with you. 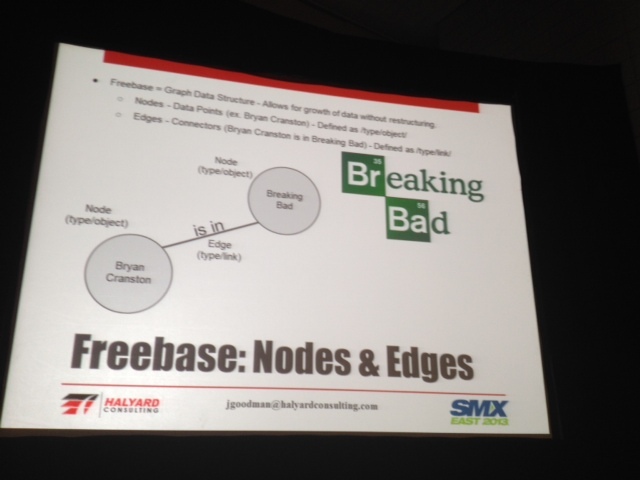 Second — I totally agree about the Freebase portion of the session! 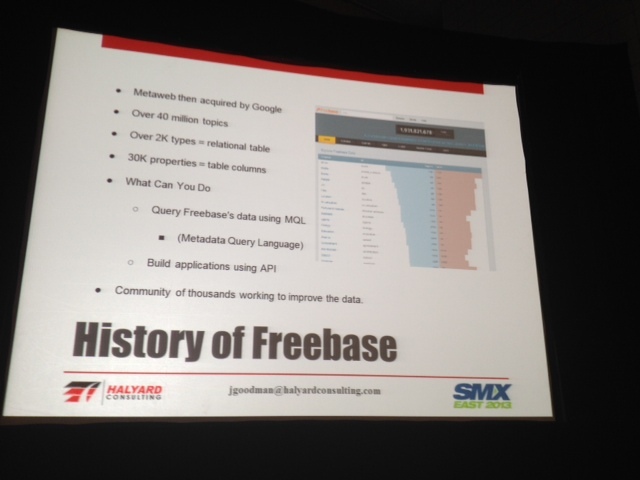 I felt like we were given an introduction to Freebase as an awesome tool that can do something….. and, unfortunately, as you mentioned that something wasn’t really clearly, tactically laid out for us. Hoping to fill in some of the blanks for myself with help from my friend Google, and keeping my fingers crossed for better coverage of the topic (should it not be rendered obsolete in 363 days) at next year’s SMX. Third — aha! Yes! Manglore. My archnemesis. The Manglore bot always says such nice things it’s hard to reject such a robot gentleman… but, I 100% agree. He needs to be stopped (and replaced with nice humans, like yourself, saying pleasant things in the comments). Thank you for bubbling Manglore back up to the surface. I absolutely enjoyed reading your blog post on this. Great refresher! Your writing style is easy to follow while at the same time, entertaining. 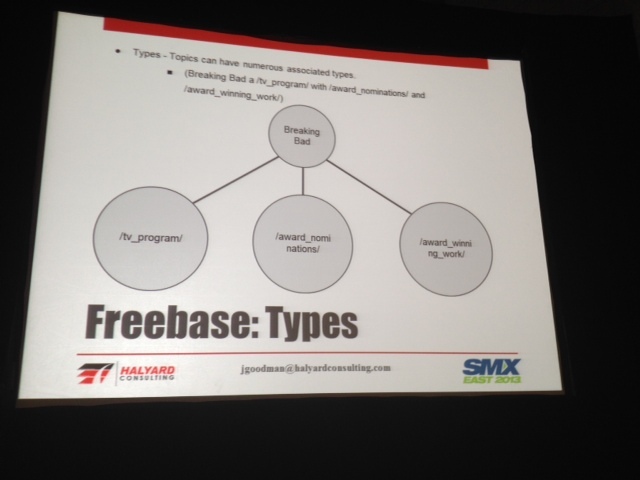 This was a good SMX session, although a bit short on details. 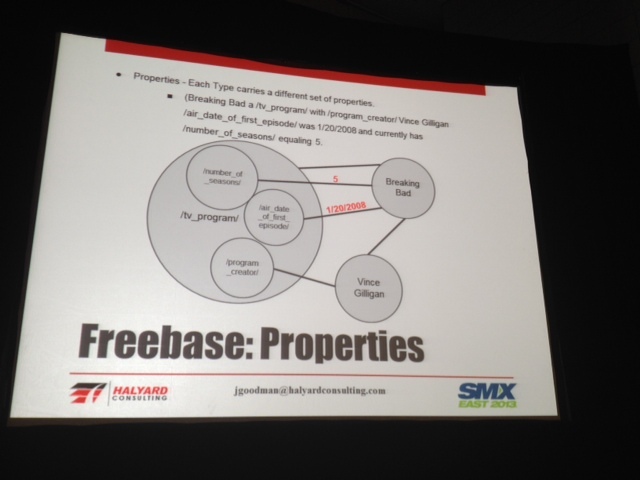 Specifically, how do you actually use Freebase, (with no intent of gaming the system), was not really answered. Chelsea, just a recommendation. You may want to use CAPTCHA to block the bots from polluting the blog comments section, so Mangalore and others of his ilk can go hide under their rocks. Ok — got an answer from David Amerland, Katrin. I’ve reached out to the presenter (David Amerland) to see if he can offer us a more tangible idea of how velocity can be inspired/monitored/etc. within the context of big data. I’ll keep you updated if/when I hear back from him. On a side note: I’d like to take this moment to mention how awesome @DavidAmerland is. 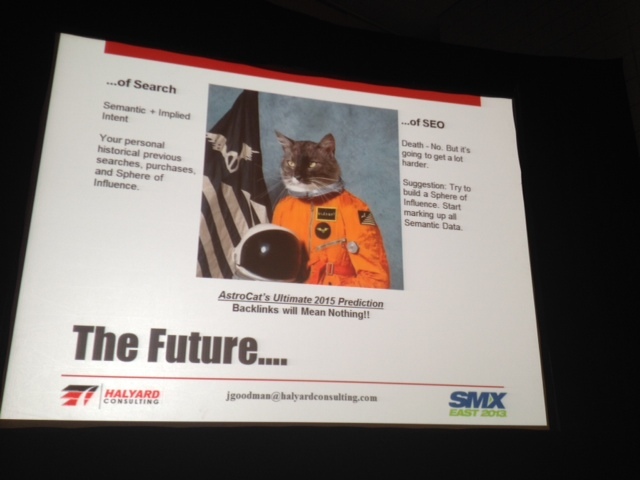 I think his presentation in this session was my favorite presentation out of the 30+ I attended and liveblogged at #SMX East 2013. He’s very smart, very approachable, and not pretentious at all. I am a fan. If you’re into big data + entity search, he’d be a good person to follow on Twitter. Great post! Do you have additional information on Velocity, which you listed under vectors of big data? Mangalore — I gotta know. Are you a real person? If you are a human and not a robot, please write back.